Spinlock’s Deckvest LITE, has been given a stunning new clean and contemporary look for 2017 along with the additions of a new model the Deckvest LITE+, which includes a harness. The compact, lightweight and colourful design has fast become the lifejacket of choice across a diverse range of watersports enthusiasts. "The Spinlock Deckvest LITE is one of the best lifejackets I have used, principally because it feels the least cumbersome. I am not going to argue that it’s the best lifejacket around for protection once activated, nor for turning a wearer in the water – plus the inability to attach a lifeline restricts its use to coastal or calm weather conditions. But if it is the most comfortable lifejacket I’ve ever worn, it’s the one most likely to persuade sailors to wear it in the first place. With its Deckvest range, Spinlock has redesigned inflating lifejackets to make them less awkward; stylish, even. It’s a style that has been copied, but is yet to be bettered. And the LITE is the lightest and best yet for any normal sailor, for weekending, coastal racing or cruising. A double zip runs all around the horseshoe-shaped jacket, which makes it easy to check and repack the fluorescent bladder. A lifting strop is hidden within and the CO2 cylinder has an easy-to-understand colour-guide to check its status. That said, you’ll need to be an expert in origami to repack the inflatable innards into the slim package. And the LITE is a fairly basic model – a sprayhood and light are optional extras – so it might be worth upgrading to the 5D model for a more feature-packed jacket. The single crotch-strap and buckles are neat and well designed to avoid snagging. The jacket also comes in a net bag for packing, allowing air to circulate when stored. Put all of this together and you have a light lifejacket that is also unobtrusive – it’s now the first item I pack when travelling to a boat test." Light weight, comfortable and easy to put on. Used for ocean racing, no problem wearing for extended periods. I changed to the manual inflation, that kit is expensive considering its only a plastic cap. 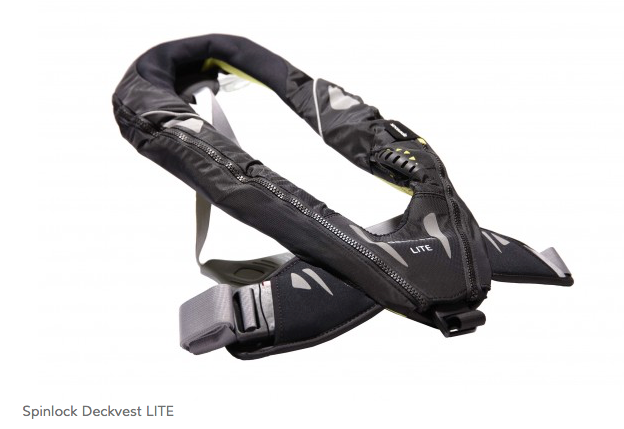 For inshore big boat racing the Deckvest Lite is the best available for this application. Whilst no serious life jacket is truly comfortable this unit is not intrusive. The crotch strap would be better duplicated as on other Spinlock life jackets but it is still OK. Any life jacket without a crotch strap should be disregarded in my opinion. Overall I am pleased with this product and am happy to recommend it for the above application.